Curry features prominently in Tonkatsu places too. Tonkatsu refers to pork cutlets and is not to be confused to with ‘Tonkotsu’, the name for the creamy, and dreamy, pork bone broth based ramen. The famous Japanese dish, katsu curry, refers to cutlet (katsu) served with rice and curry. You could even have a chicken katsu curry and not just pork. When I asked my Tokyo based food-writer friend, Yukari Sakamoto, whose book Food Sake Tokyo was our Bible during our time in Tokyo, about her views on curry then she had the following to say, “Curry? I love to eat it. Both Japanese style and Indian”. 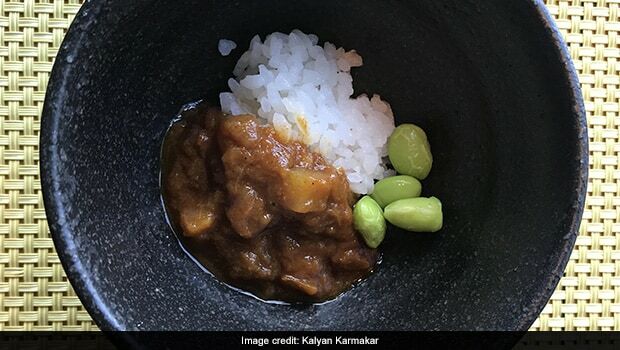 back story to this curry which Japan based Bangladeshi expat writer, Probir Bikash Sarkar, spoke of in an interview to the Sunday Telegraph in September, 2013. Starring in this story is the late Rashbehari Bose, an Indian freedom fighter who had taken refuge from the British in Japan in 1916. He then married a Japanese lady named Toshika who unfortunately passed away due to tuberculosis in 1925. His father-in-law, Aizo Soma, ran a bakery called Nakamura Bakery which was earlier owned by the Nakamura family. Two years after his wife’s demise, Bose told his father-in-law that he wanted to sell chicken curry and rice in the bakery. They then set up a restaurant called Indo No Mone to sell the curry. Bose used his own recipe for this and the result was a curry which was different from what was prevalent in Japan then. It was called the Indo karii or Indian curry. Indian curry? But aren’t all curries ‘Indian’? Curry was introduced to Japan during the Meiji era (1868 – 1912) it is said, by the officers and cooks of the British Royal Navy. Emperor Meiji, who ruled Japan then, was instrumental in transforming the Japanese from an insular feudal society to one open to Western influences. This also meant that Western dishes such as pasta, bechamel sauce-based bakes, cakes and puddings and custards began to enter the Japanese culinary space. You still have restaurants in Japan offering these dishes. These are similar to the classical 18th and 19th century French-influenced fare that you will still find in restaurants such as Mocambo and Peter Cat in Kolkata, the United Coffee House in Delhi and Gaylord and Gallops in Mumbai. Memories of the British empire that lingered on long after it was disbanded. So, do think twice before you go running into the nearest ‘curry’ shop when in Japan looking for ghar ka khana (Indian food). You might be better off going to the token Indian restaurant, which every big mall in Japan seems to have, instead. These places hawk chicken tikka masala and saag paneer and bear names such as ‘Taj Mahal,’ ‘Jaipur’ or ‘Saffron’, as most Indian restaurants located in tourist spots across the world seem to be. There are more Indian restaurants tucked in the lanes of the cities which locals would be familiar of. We rarely eat Indian food when travelling abroad so I will not be able to tell you much about them, I am afraid. I did try out a few Japanese curries during the trip for the sake of ‘research’. The first was at the Edo Museum in Tokyo. The complex has an outlet of a restaurant named Misaka Kaikan, which traces its origins to 1925. We tried the seafood curry there. What struck me about the curry was that it seemed to have a very distinct ‘Parsi’ aroma. Let me explain what I mean. The dominant taste memories that the curry evoked in my mind was that of the Parsi sambar masala which is not to be confused with the sambarof south India. The curry was rather thick and seemed to be a cross between theParsi dhansakand kaala masoor dalin terms of both texture and colour. The thickness of the Japanese curry comes from the use of roux, a flour and fat based thickener used in French cooking. This makes the curry far more viscous than the curries that we are used to in India. Interestingly, Misaka had a dish called ‘Indian chicken curry’ in the heritage section of their menu. My last curry exploration took me to a curry shop named San Marco at the Osaka station. The aromas that greeted me when I stepped into the shop took me back to the Bangladeshi run ‘Indian’ curry shops in London’s Brick Lane. Curry powder, garlic, red chillies being the dominant notes. Yet, when you looked around, there were only Japanese folks in the restaurant. No Bangladeshis or British, and definitely no Indians.